Some thousand participants gather in Jerusalem at an event in honor of the completion of the Talmud Bavli (Babylonian Talmud). Some thousand participants gathered on Sunday morning at the International Convention Center (ICC) in Jerusalem in honor of the unique event of completing the Talmud Bavli (Babylonian Talmud). The event was led by the Association of Yeshivot Hesder and leading rabbinical figures of religious Zionism. The event, named “Yachad Be’Kedushah” is a non-stop studying marathon whereby hundreds of studying couples (Hevrutah) undertake the task of completing eight Gemara pages for each couple. The goal is starting and completing the entire Talmud Bavli - no less than 37 Masechtot (tractates) - 2,711 pages - all on the same day. The learning marathon began at 9:00 a.m., with many Heads of Yeshivot, graduates of Hesder yeshivas, Ministers and Members of Knesset. Professor Simcha Goldin, father of fallen soldier Hadar Goldin of blessed memory, shoes body is still held by Hamas, opened the event which lasted through 6:00 p.m. Upon completing the Talmud Bavli, Rabbi Avigdor Neventzal delivered the traditional Hadran. Rabbi Neventzal has been teaching Gemara for 50 years at the Kotel Yeshiva in Jerusalem. Grandfathers of baby Amiad Israel Ish-Ran, may god avenge his blood, who was murdered in the horrific terror attack in Ofra several weeks ago, recited the Kaddish prayer. A mass Arvit prayer and uplifting dancing circles of rabbis and their students concluded the unique gathering. Members of the Jewish Home party referred to recent declarations delivered by Ministers Naftali Bennett and Ayelet Shaked who quit the party and announced the launching of a new political platform called “Hayamin Hachadash” (The New Right). 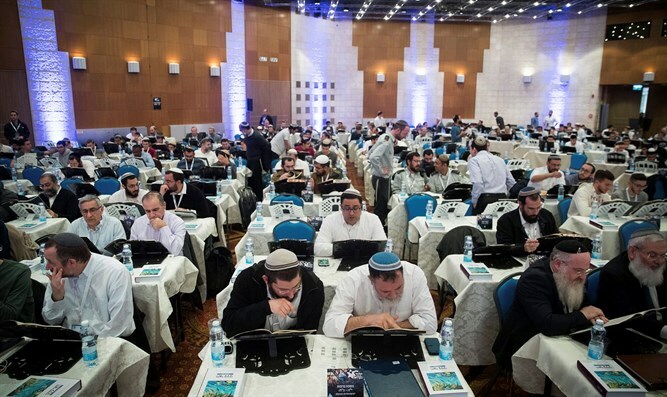 During the event, rabbis from various Yeshivot Hesder and Rabbis of the Council of Yeshivot Hesder took part in the learning marathon, among them were: Rabbi Haim Druckman, Rabbi Yehshoua Weisman, Rabbi Tzvi Kostiner, Rabbi Yoel Manowitz, Rabbi Shmuel Habber, Rabbi Shlomo Rosenfeld, Rabbi David Pendel, Rabbi Itzhak Ben Pazi and Rabbi Eyal Greyner. In Addition, many Hesder students took part in the event: platoons of soldiers serving in Givati and Kfir infantry brigades and more than 50 students from high school Yeshivot like Darchey Noam, Petach Tikva and Bnei Akiva Yeshiva, Raanana and Givat Shmuel. The project was very successful in bringing together various sectors and religious movements, including prominent rabbis of religious Zionism alongside leading Haredi rabbinical figures, among them: Rabbi Avigdor Neventzal, Rabbi Nechemia Goldberg, Rabbi Shlomo Dyechovsky, Rabbi Dov Landau, Chief Rabbi David Lau, Chief Rabbis of Jerusalem - Rabbi Arie Stern and Rabbi Shlomo Amar, Rabbi Ben Zion Hacohen Cook, Rabbi Yaakov Ariel, Rabbi Dov Lior, Rabbi Asher Weiss, Chief Rabbi of the IDF, Rabbi Eyal Krim, and many more. Donations and incomes gathered for the events will be dedicated to more than 24 different projects, categorized under three key fields related to the religious Zionist world of Yeshivot: Torah, IDF and the Israeli society. Among those projects, there are plans to build a mobile Beit Midrash which will be available for soldiers in the field; first responders team that will assist municipal authorities and elderly people in emergency situations; integration of students with special needs in Yeshivot Hesder, funding scholarships for students in need, funding scholarships for volunteers from abroad while serving in the IDF and additional welfare and social projects. All projects will be led by the Association of Yeshivot Hesder together with all the Yeshivot.